This handsome fella is a stag beetle. We snapped him sauntering past our local pub. With apparently not a care in the world. But it turns out the stag beetle’s a globally threatened species. His favourite habitat in decaying woods has been lost and he’s declined big time the last 40 years. Although curiously, he is holding on right here in London. And particularly in a sweep of south London along the line from Beckenham to Herne Hill and then following the 37 bus route over to south west London as well as round Wimbledon! 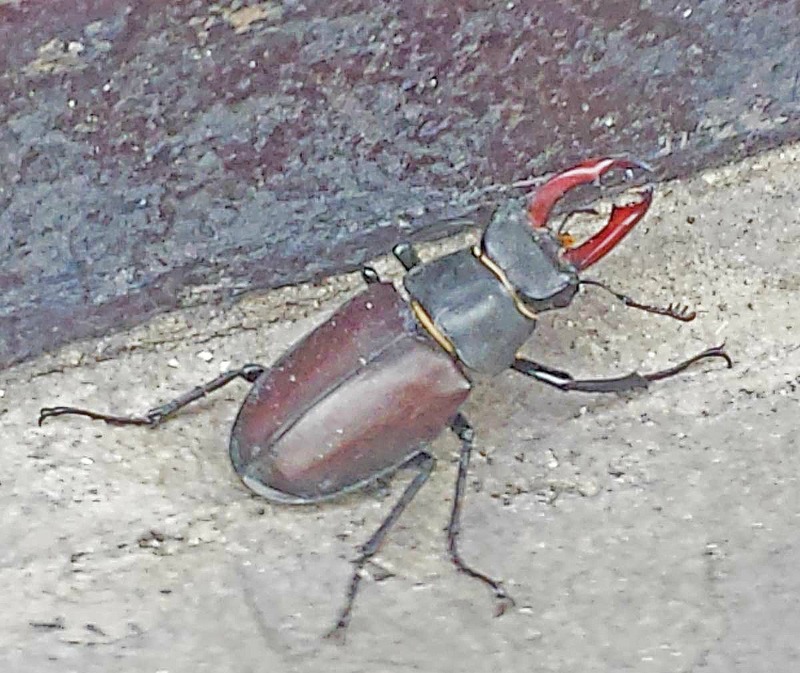 I mean we always knew south London was the best, but what makes it so great for stag beetles? And that’s the big question that the London Wildlife Trust are trying to answer. To help, keep your eyes peeled from May to July when the stag beetles are out and about and send any snaps to Stag Beetle Sam on Twitter or log your sightings with Wild London. We can all also help the stag beetle by creating simple loggeries in our garden or at school – it’s kind of like a log pile but the logs need to be vertical and submerged 50cm or so into the ground. The loggeries are super important ‘cos Mrs “Mum” Beetle lays her eggs underground next to them. And her babies will feed on the hidden logs for six years before transforming to an adult stag beetle. Wow! That’s some serious munching! And it does wonders for our garden soil. Which is another fab reason for us all to do our bit to save the stag beetle. And my new Facebook page which is all about kids and nature.